I purchased this little book of poetry sometime last year on a whim. It didn’t pop back up on my radar until after I read The True Deceiver, and discovered in the course of writing my review that both books were nominated for the 2011 Best Translated Book Award. I immediately pulled it out of the pile and devoured Flash Cards in just a few short hours. It’s a brilliant, beautiful collection of poems. I’ve returned to it several times since that first reading to re-visit my favorites. Yu Jian is a Chinese poet. “The second bestselling contemporary Chinese poet, behind Bei Dao” we learn in his translator’s, Ron Padgett’s, thoughtful note (really more of an introduction) at the beginning of Flash Cards. The three pages of Padgett’s A Note on Translating Yu Jian provide a unique portrait of a poet living in today’s China. It’s followed by an equally interesting analysis of the poetry by Simon Patton, who discusses T.S. Eliot’s influence. And then we get to the meat of it: the seventy-five poems that make up this collection. Throughout the book Yu Jian grapples with China’s vast cultural history in an attempt to contextualize its present. He repeatedly uses the traditional symbols and motifs – Autumn, leopards, flowering fruit trees, a porcelain bowl – and then contrasts them to a much less elegant modern world. And so peach blossoms become pink cosmetic boxes glimpsed from an escalator and a presumably priceless Shang Dynasty antique reveals itself to be a mass-produced bowl used to hold chicken soup. He shows us a China disconnected from its past. The poems are short and yet, in just a few lines, Yu Jian tells surprisingly complex stories. This collection is not political. But I still couldn’t help thinking of the Chinese artist Ai WeiWei and his 1995 piece: Dropping a Han dynasty urn. Both artists are smashing tradition – though, perhaps not so dramatically in Yu Jian’s case. Both challenge the public’s attachment to a China that no longer exists by co-opting its icons and placing them within what has become an almost alien environment. In Yu Jian’s case this includes the art of poetry. Nothing, it seems, is sacred. Yu Jien does not sacrifice beauty for meaning in his writing. Nor do the translators. The surprisingly lovely imagery, the distinctive meter and rhythm of these poems seems to have been strictly held to – an English and a Chinese translator collaborating to protect the integrity of the work. For those who have to ability to confirm this: the original Chinese text is printed on the page facing the English translation for each of the seventy-five poems. The paperback is well designed with clean-cut pages and french flaps. In short: Zephyr Press has done a wonderful job. Not surprising, as the non-profit, independent publisher specializes in international poetry translations. 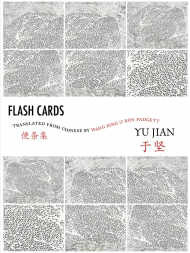 Flash Cards is a joint project with The Chinese University Press and the Jintian Literary Foundation.